You know what looks kind of strange, even unsettling? A perfectly pristine denim jacket on a man. It’s like a shirt with every single button done or a meticulously gelled combover; something about it gives off American Psycho vibes. On the other hand, a ratty jacket with gaping holes and whiskery frays appears to have barely survived a bar fight with a raccoon. 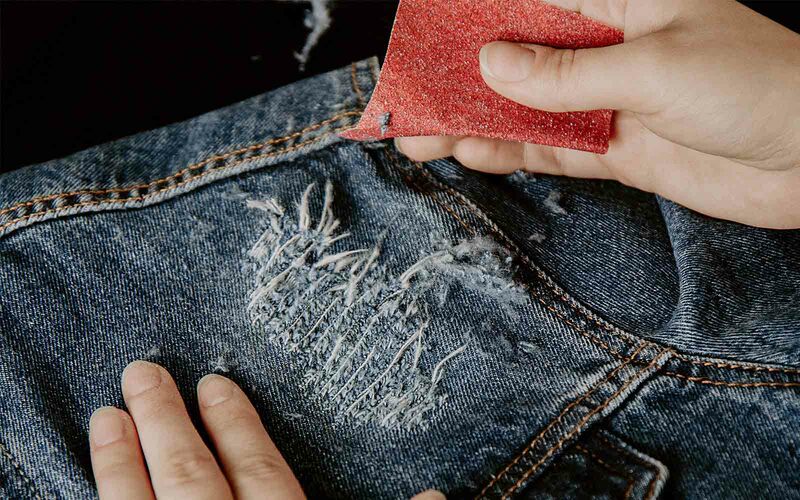 That’s why we’re giving you a manual: How to Distress Denim, flawlessly. Denim, on some level, is meant to be distressed. Invented as workwear for gold miners, jeans have always possessed a rugged charm. From the hypermasculine Marlboro Cowboy to modern streetwear aficionados, distressed denim takes the gold for timeless cool. But in order to nail this look, you should know how to distress jeans the right way. You want tastefully “off-the-cuff” distressed; not “on-the-run” distressed, like an asylum escapee. We’ll show you exactly how to make a ripped denim jacket look good. Have you ever just splattered paint on a blank canvas? Maybe you were seized by creative fervor, but chances are, your artwork turned out looking crappy. 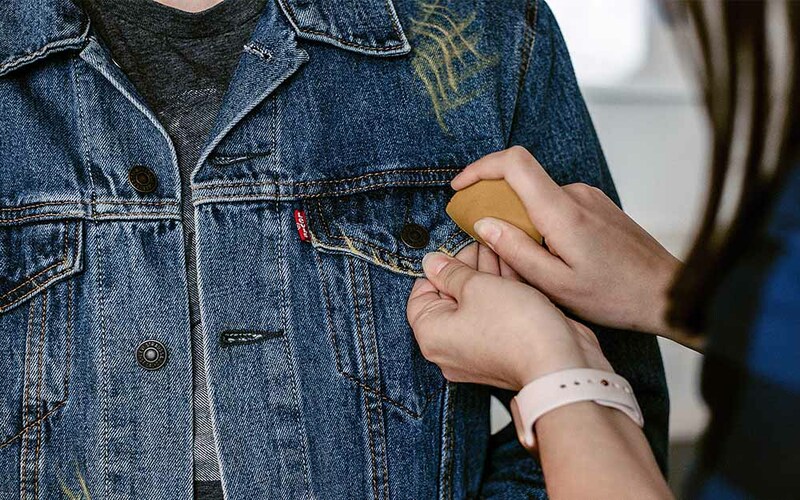 A lack of preparation is the easiest way to ruin an expensive jean jacket. Get inspiration online. 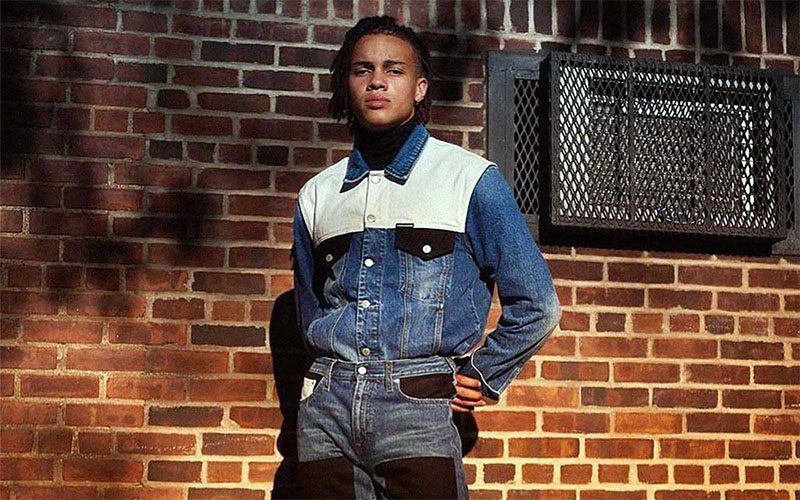 Search Pinterest and Instagram for examples of denim jackets that call out to you. How heavy is the distressing? 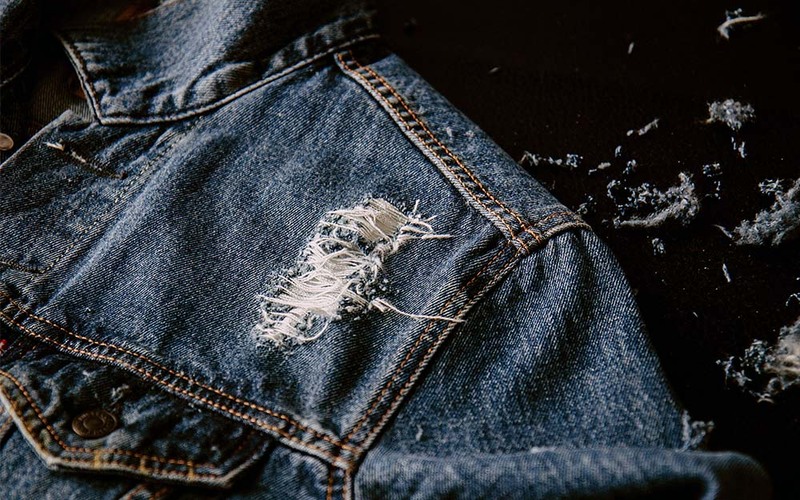 Where are the distressed patches placed? To plan properly, wear the jacket for a more accurate feel of where you’d like the distressed marks and holes. Mark these areas with chalk. Try to imagine areas of your jacket that might get distressed naturally over time. Like the shoulders, the collars, sleeve cuffs, and seam ends. You may want larger distressed patches on the shoulders and on the bottom back. Protip: if you want a hole around your elbow, mark 1-2 inches above and below the joint. 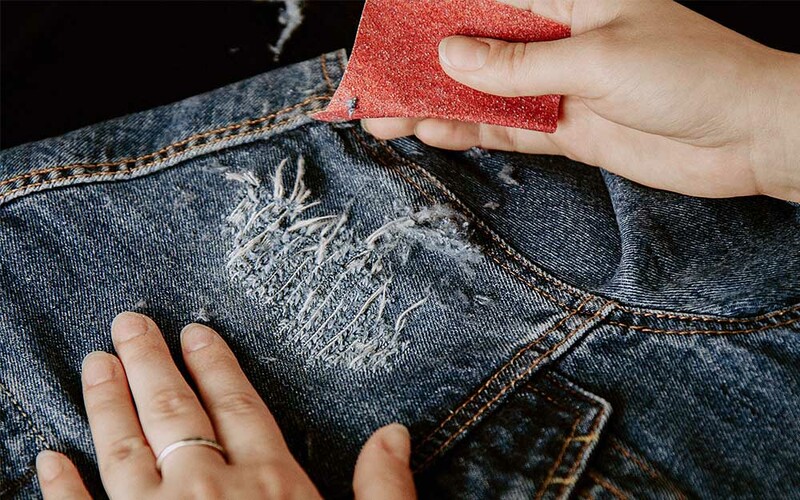 A few different approaches on roughing up your denim to create the perfectly ripped jean jacket. 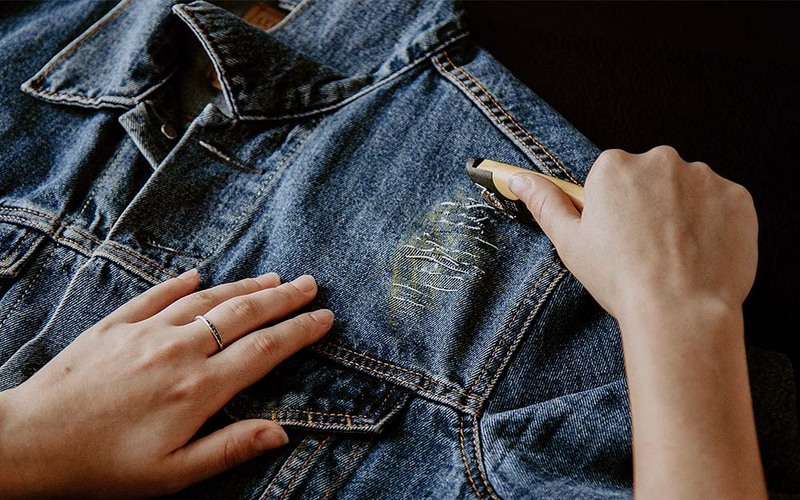 Here’s how to make holes in your jeans and jean jacket. Remember: your box cutter is your paintbrush, and just like paint on a canvas, it’s permanent. Be deliberate and precise with your marks. Cut along the areas you had outlined with chalk. Before you cut, add a layer of cardboard beneath the layer of fabric you’re cutting. This way, you won’t tear through both layers. With your box cutter, cut horizontal lines about 0.5 inches apart from each other. For a natural looking tear, cut in a diamond shape, with shorter slices that grow gradually longer midway and return to short at the end. Use sandpaper to distress your cuts. Try to use coarse grit sandpaper and rub horizontally across the cuts until you see a blue fray appearing. These are the blue threads separating from the white threads. The short vertical blue fibers are the manufacturer’s synthetic dyed threads. Now using your tweezers, carefully remove the blue threads away from the white threads. Tease out the white horizontal threads, loosening them but being careful not to break them. Use a lint roller to remove any excess string and fabric particles. For slightly lighter distressing, you can also use the sandpaper to scuff up the jacket without cutting holes. The erosion will give your denim a faded look. This is best for areas of the jacket that have two sides sewn together, like the bottom, the collar, or the sleeve cuffs. Pinch up the top layer of fabric to separate it from the second layer. Use clips to keep the two layers separated. Take your scissors and make small snips along the pinched part. You can use your fingernails to distress these cuts a bit. Use your sandpaper again to distress more. Distress along the seams for a complete rough and worn aesthetic. 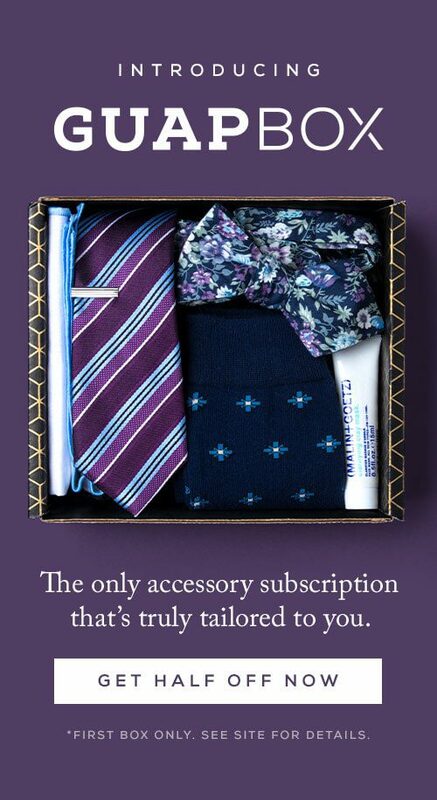 This includes the edges of your jacket and the pocket seams. 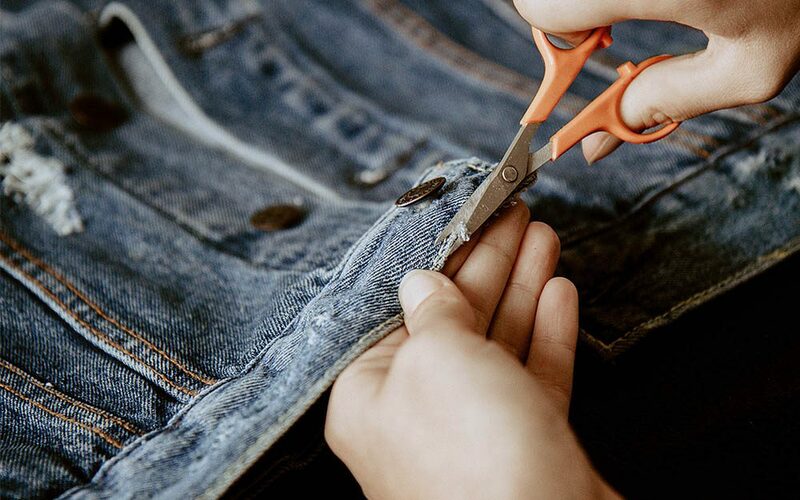 Use scissors to cut small pieces off the very ends of your jacket, horizontal to the seam. Be careful not to cut the stitching that holds the end pieces together. Use your sandpaper to distress these cuts. Put your jacket through a cold wash to get rid of any remaining debris. Make sure to use cold water, as warm or hot water could destroy the newly-torn fabric. Then run your jacket through a dry cycle so that each fresh and deliberate cut will get a naturally worn edge. 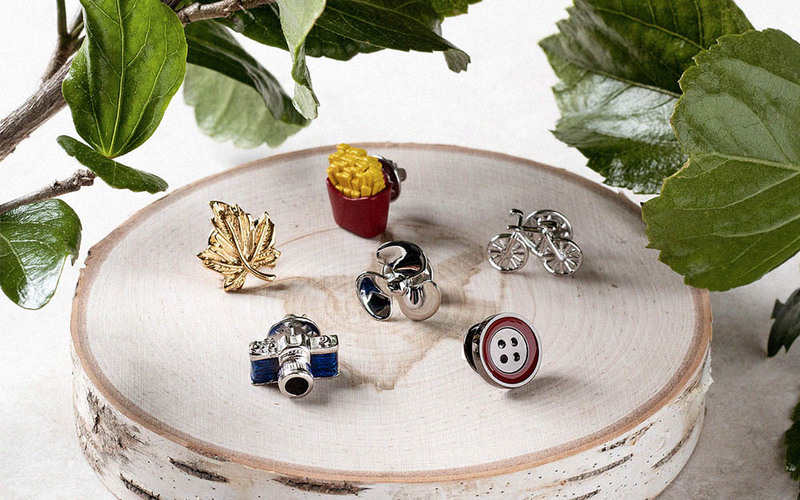 Top off your personalized distressed denim look with some expressive details, like lapel pins. 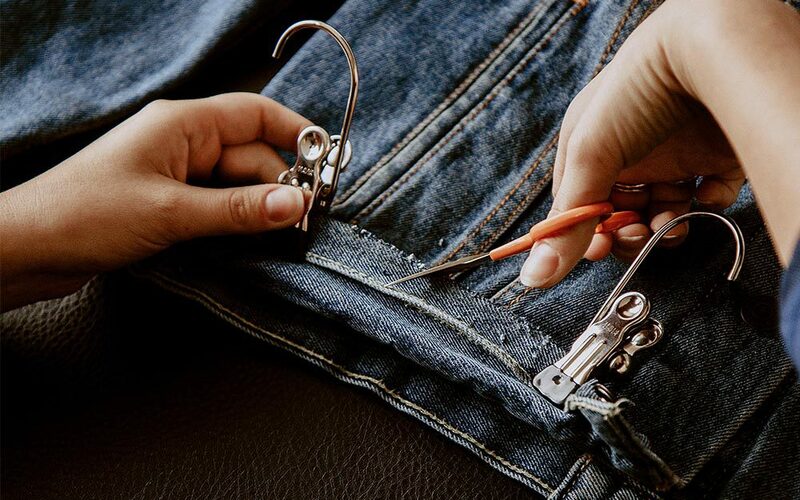 Now that we’ve demonstrated how to distress denim flawlessly and to your liking, go ahead and try it out. Feel free to post your results in the comments. No speak Americano? Why not wear it.